1. Take 190 grams chicken breast and cut it into small pieces. teaspoon red chili, 1 teaspoon chaat masala, 1 teaspoon salt, 1/2 teaspoon lemon juice and mix it well. 3. Marinate for 1 hour. 4. In a mixing bowl, add 150 grams all purpose flour, 1 teaspoon salt, 80 milliliters water and knead it into a smooth soft dough. 6. Heat 15 milliliters oil in a pan, add the marinated chicken in it and cook for 7 - 10 minutes on medium heat or until the chicken is cooked through. 7. Remove it from heat and keep aside. 8. Take a ball from dough and flatten it with the help of a rolling pin. 9. Place a spoonful of chicken mixture in the centre and shape into momos. 10. 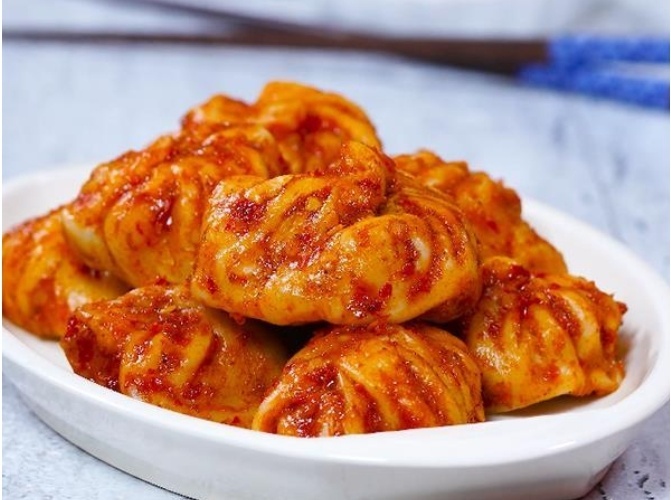 Place the momos in a steamer and steam for 10 - 15 minutes. 11. Remove it from the steamer and transfer it to a bowl. 12. Add 1 teaspoon tandoori masala, 50 grams red chili garlic sauce and mix it well.